A helpful summary: the election of Maduro is not considered legitimate. As such his term in office expired on January 10. As the constitution dictates this is seen as a power vacuum and the speaker of the National Assembly, Juan Guaido right now, becomes interim president of Venezuela until new elections can be held. More here. What meant the humongous march of Saturday February 2? 1) marches inside the country were bigger than on January 23 and this time around even reached small towns and villages. It is a truly national movement, even in most chavistas stronghold that do not look that strong anymore. 2) the opposition managed that only through social media. All press and airwaves media are censored with a few limited exceptions. Thus information on marches, rallying points, etc, is done through Twitter, Facebook and Whats-app. This also bring the point that in spite of years of strangulating Venezuelan media, in the end it was all for naught. 3) the regime managed to put up a single rally in the country on Bolivar avenue that they did not manage to fill half way, whereas the opposition filled up a similar avenue AND surrounding streets. Being charitable, the regime may have gathered 25% of what the opposition did. But with two notes to make things worse: there was no parallel rally for the regime elsewhere in Venezuela; the regime had to ferry in a lot of its attendees in bus and through threat; in Caracas today large contingents of popular areas join the opposition marches. February 2 was an immense show of force that established without the shadow of a doubt that Maduro has lost support of the country. In a normal country, he would be resigning. Here he threatens violence. Another fun note: the regime tried to photo shop their low attendance and got caught. For example a main chavista paper, Ultimas Noticias, was caught red handed posting a front page a picture next day of a chavista march years ago, when there was enthusiasm. People quickly noticed that a building existing today was not on the pic. Where is Maduro support now? Clearly the fight now is not of the cold war type, you know, commie versus plutocrats. It is not about oil control as the left would have you believe (Venezuela is now a small player, in a world going green). The clickable map shown here splits the separation as being between democracies and authoritarian to totalitarian countries. Draw you own conclusions. The situation got worse today as the European Union made good its threat of recognizing Guaido if elections were not called. Now all countries that matter are against Maduro or at least shut up, with the disgraceful exception of a few like Mexico, Uruguay or Italy (though in Italy it seems to be a reflection of an internal power struggle where the 5 Stelle movement is anti everything). As for the country of Mandela, words fail me. He got boxed in by himself. In a way international condemnation does not matter to the regime since so many are going to jail that they would refuse to leave power no matter what. Even though they know that neither Russia or China is in a position to offer real militar support there holding firm, so far. The changing situation would make stubbornness a risk since it could lead to some form of intervention that now would be widely supported. Their time to negotiate some exit may have passed. 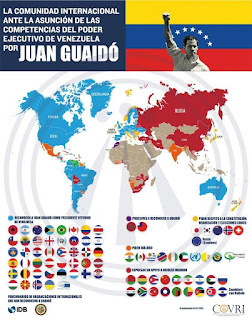 The condemnation by "capitalist countries", but democratic, also means that one by one assets of the regime will be frozen and/or passed to Guaido control. This will make it impossible for the regime to manage the internal problems. People are determined now to get rid of Maduro, and going a little bit hungrier for a few weeks is not a problem for them anymore. What can the opposition do? Keep a cool head, do not cave in any of the extremes petitions. It has been clear for a long time that the opposition was not able to remove the regime though any pacific mean. Only international pressure has a chance at doing that with limited damage. The opposition role is to explain to the people what is going on, to keep united, and to be ready to receive control of the country when the day comes. I am still puzzled as to why the regime didn't cut Guaido off at the knees and arrest him early in this movement as they have done so many times? Why the opposition is being allowed to operate as freely as they have? All this seems to hinge completely on the Venezuela military who appears to have 10 to 20 percent loyal but are leaders and 89 to 90 percent who would welcome change but are grunts. How do they convert the loyal leaders of the military or get the grunts to rise up? Is the hope that the aid importation program becomes the catalyst that sparks this to happen? Addition: Refusing to indulge in any "dialogues" or negotiations with the Narco Kleptocracy is very important, well done by the Gman and co. Exception: "It has been clear for a long time that the opposition was not able to remove the regime though any pacific mean. Only international pressure has a chance at doing that with limited damage." International pressure or International Military Intervention? Daniel keeps reiterating that the Genocidal Narco-Kleptocracy won't go down easy or peacefully resign, they risk JAIL. They still have hefty oil revenue from India and others, plus the enormous Drug Trade revenue no one talks about, plus the Mega-Guisos such as the gargantuan Food Scam, and countless other Guisos in Finance, Gold, Customs, etc. Plenty of cash to keep Bribing the corrupt military and armed forces and remain atornillados in power for months to come, while people keep dying. I wouldn't discard the military option, which could be the only real solution to expel the criminals in charge. Heck, I'm hope the Chavista thugs intercept this week's humanitarian aid convoys, just to give the US a perfect excuse to use force, and hit Miraflores with a few choppers and Seal Team 6, to end this Chavista nightmare once and for all. I follow your argument regarding legality (or otherwise of the election), however I recall reports that the post fell to Guaidó because his status in the AN. Any incoming President is required to be sworn before the AN within a limited period. If Maduro was not sworn in by the AN (but rather the Supreme Court - not even the Constituent Assembly!) then the constitution fingers the person in the position Guaidó occupied to assume the position pro tem. Daniel, IIRC, there was a General who resigned circa 2000 because Chavez was permitting corruption from his cronies. Does this ring a bell? Thanks. No need, Daniel. I found the source in Rory Carrol's Comandante: General Urdaneta. As I see it the only hope Guaido and the opposition have is to bribe Cabello with 500 million and immunity to keep all he has stolen, however, even that would require him to double cross the mafia and not sure he would take it. The USA and world will never take direct military action no matter what. They may support a fraction of the military who would break away with arms and such but they will never set foot on Venezuelan soil. This all is for not if they cannot figure out a way to separate those top generals from the grunts in the military. If the people were going to take up arms themselves they would have already done it. They protect on the hope that it will generate an uprising by USA or the military but the real fighters in Venezuela were smart enough to get out a long time ago. Venezuela is now a small player, in a world going green. Not true. Venezuela has the largest oil reserves and oil is still important. True, oil is not as expensive as it was 10 years ago but this is mostly due to fracking and the fact that China has slowed its industrial output somewhat and does not need as much oil. Oil is still king. With some dauphins around to be sure but a king nonetheless. It is obvious that western (and western allies) support is welcome by the opposition to Maduro. It is also obvious that when someone receives much needed support, he/she does not care about the motives of the ones who offer such support. Plus, I do believe that most of the opposition does not mind having American or European companies controlling Venezuelan oil, so they do not consider privatizing the national oil company in favor of american/european interests as something bad. Therefore, they view it as a cheap price to pay for any support. However, it is either naive (or pure propaganda) to say that the interest of the western world is not oil fueled. After all -let's take it as a given that Maduro is a dictator for the sake of discussion-, there are many dictatorships all around the world(most of the world is run by them) but the western world has not really shown any interest in taking any of them down. In many countries there have been elections whose results were ignored by authoritarian regimes but there has not been any similar outcry. The Venezuelan opposition is going to pay western support with oil. That much is expected. The Venezuelan opposition will also refuse doing that while doing that. This is also expected. That's that. Keep talking the talk. Anonymous - why would Canada want the Western world to have access to this competing oil to its oilfields. It's not all oil. Anonymous, what do you think of this proposal on the future relationship of the United States with Venezuelan oil? Venezuela has been a constant, stable, and reliable supplier of oil to the United States. Through global crises and calm, Venezuela has been, and remains, a consistent and dependable source of crude oil and petroleum products for the United States. Venezuela assigns great value to its long-standing relationship with the United States and the long history of oil trade between our two countries that has benefited both countries so much. We are now ready to look to the future. PDVSA's new business plan for increased production is both ambitious and realistic. While this increase will be achieved principally from substantial investments by PDVSA, there will also be sizable investments by foreign oil companies, including U.S. companies, in Venezuela. We welcome the involvement of U.S. companies in the Venezuelan energy industry and believe it is beneficial to both countries. In fact, we anticipate greater involvement by U.S. and other foreign companies in both the Venezuelan oil and natural gas sectors in the future. From our vantage point, the energy ties between the United States and Venezuela will be strengthened each year far into the future. We are determined, and committed, to do our part to make sure that the United States will always have enough energy at affordable prices to meet its needs now and for the future. Other Venezuelan News and Views regulars, please hold off until Anonymous has replied. Thank you. Differ with you, anonymous. Support for Venezuelan freedom is all about geopolitics - proximity of Vzla to US and Canada. Boludo, he is not going to respond to your post. False propaganda has its limitatioms. Besides, he is busy posting the exact post in multiple other forums. Boludo, I am not replying to anonymous, almost all the time chavista trolls, we have quite a lot of experience with this. I am just correcting a major misrepresentation of the true size of Venezuelan reserves. That is very likely not true. Independent evaluation of the reserves has not been done. And the results shown have some serious problems according to oil experts. Still, even if we assume that the Venezuelan reserve are the largest in the world, the real question here is how easy they are to exploit. And that is even less documented. Having the largest reserves in the world is useless if you do not have a way to benefit from them. This is a different argument. Because I am not an oil expert, though I have read independent reports, I do not want to delve into technicalities. The oil reserves are large enough (if not the largest in the world as some reports claim) and regarding exploitability, about 50% of the reserves is so easy to extract that it is profitable even now. True the other 50% is a bit harder to get but oil will not stay cheap forever and the USA know it. You can't be a superpower without looking ahead. My original posting consisted of quotes from from Statement of the Embassy of Venezuela Before the Senate Committee on Energy and Natural Resources (March 4,2004). For the PSF who claim that the reason for the current US policy stance on Venezuela is that "the US wants to steal Venezuelan oil" this quote is a reminder that five years into Chavismo, even Chavismo didn't see anything wrong with a partnership with the US in oil.